Well-designed websites and snazzy mobile apps aren’t just for travel search engines anymore. JetBlue Airways (s JBLU) just debuted its own native app for the iPhone(s AAPL), an app that lets users search for and book flights from their mobile phones. The low-cost airline also unveiled newly redesigned web and mobile sites with clean user interfaces and new features such as personalized flight recommendations based on users’ travel history and geolocation data. It goes to show just how much startups such as Hipmunk, HotelTonight, Room77 and others have spurred innovation for the travel industry’s more-established players. And more such developments are on the way: A recent Airline IT Trends survey found that 90 percent of airlines are increasing their investment in mobile capabilities, according to a report by CNN published this past fall. Another notable example of this larger trend is luxury hotel chain The Four Seasons, which last month gave its website a makeover that taps into social media and incorporates user-generated reviews and photos of its properties. In all, it is nice to see large corporations such as these tapping into newer technologies and investing in mobile app development, realizing that spending the money on making these tools can ultimately drive more business. Of course, as these established travel companies step up their game in a bid to bring customers directly to their sites, aggregation engines will in turn have to bring even better user experiences to the table. It is a competitive cycle that should ultimately benefit us consumers more than anyone else, which is always a good thing. 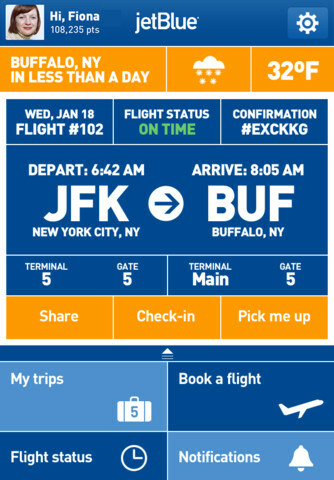 Congrads jetblue – very slick redesign indeed! :) One pointer – ‘blue’ is in your name, but having blue text and blue links might be confusing (even if the links are a bit brighter). Otherwise, beautiful redesign – pleasure to use! Wish the companies here in NZ had the apps available to make our lifes easier as well. Jetblues is amazing but some flight attendance treat passager like lillte kids specially the fligjt from Orlando to PR the one speak spanish. I they do it in another state I don’t know only from NY to Orlando. I travrl a lot and this flight attendand Latinas need to go back to get some education. Tjamks, Gonny L Ramos.